Empirical evidence has recently been provided for the distinctiveness of emotion words as compared to abstract and concrete words for monolinguals, calling for a reconsideration of the relation between emotion and language. The present study investigates whether the distinctiveness of emotion words among monolinguals holds for foreign language learners. To this end, three groups (n = 120 per group) of late Arabic-English bilinguals who learned English as a foreign language completed tasks including free recall, rating, and discrete word association. One group completed the tasks in Arabic while the other two groups, representing two levels of foreign language exposure, completed the tasks in English. 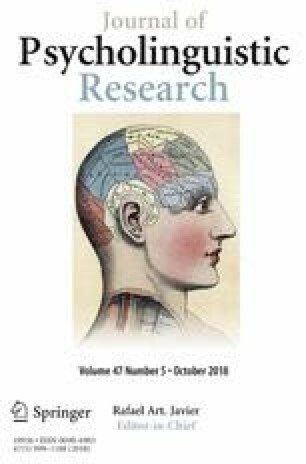 Planned comparisons indicated the distinctiveness of emotion words in the participants’ first and foreign languages in the free recall and rating tasks while no significant differences were found in the word association task. The results are discussed in light of the existing literature and relevant theoretical models. The researchers thank Prince Sultan University, Kingdom of Saudi Arabia, for funding this research project under Grant Number IBRP-CFW-2016-11-17. This study was funded by Prince Sultan University, Riyadh, Saudi Arabia (Grant No. IBRP-CFW-2016-11-17). Informed consent of participants was collected orally as uninterested participants had the option to leave the classroom during the experiments. Rodriguez, M. B. (2016). The effect of word type in the first stages of foreign language acquisition. Master’s thesis at the Public University of Tarragona, Spain. Retrieved from http://diposit.ub.edu/dspace/handle/2445/102244.